Lowest prices all the time, guaranteed! If you find a better price, let us know. Blue tones and stripes give this ensemble a clean, relaxing look. Fine, close quilting and detail has a luxurious look. The Colonial Blue , Denim & Jacqueline colors from our solid Quilted Matelasse collection are coordinates. 66" x 86" twin quilt. Bold blue and white stripe. 100% cotton face, cotton filled, prewashed, luxury oversized. By C & F Enterprises. Allow approx. 3 weeks delivery on this item. We offer the complete line of items in the Nantucket Dream ensemble. 90" x 92" full/queen quilt. Bold blue and white stripe. 100% cotton face, cotton filled, prewashed, luxury oversized. By C & F Enterprises. Allow approx. 3 weeks delivery on this item. We offer the complete line of items in the Nantucket Dream ensemble. 108" x 92" king quilt. Bold blue and white stripe. 100% cotton face, cotton filled, prewashed, luxury oversized. By C & F Enterprises. Allow approx. 3 weeks delivery on this item. We offer the complete line of items in the Nantucket Dream ensemble. 21" x 27" standard sham. Bold blue and white stripe. 100% cotton. By C & F Enterprises. Allow approx. 3 weeks delivery on this item. We offer the complete line of items in the Nantucket Dream ensemble. 26" x 26" euro sham in narrow blue and white stripe. 100% cotton. By C & F Enterprises. Allow approx. 3 weeks delivery on this item. We offer the complete line of items in the Nantucket Dream ensemble. 39" x 76" bedskirt in narrow blue and white stripe. 100% cotton. By C & F Enterprises. Allow approx. 3 weeks delivery on this item. 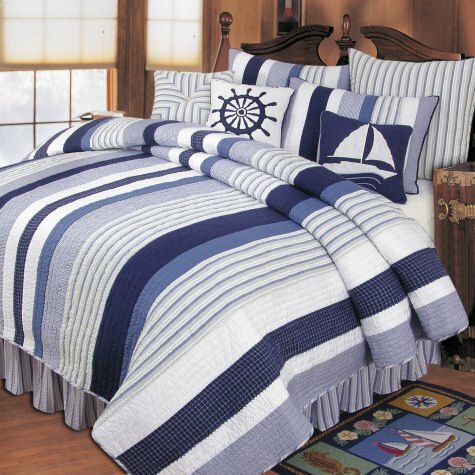 We offer the complete line of items in the Nantucket Dream ensemble. 60" x 80" bedskirt in narrow blue and white stripe. 100% cotton. By C & F Enterprises. Allow approx. 3 weeks delivery on this item. We offer the complete line of items in the Nantucket Dream ensemble. 78" x 80" bedskirt in narrow blue and white stripe. 100% cotton. By C & F Enterprises. Allow approx. 3 weeks delivery on this item. We offer the complete line of items in the Nantucket Dream ensemble. 14" x 14" miter striped pillow. 100% cotton. By C & F Enterprises. Allow approx. 3 weeks delivery on this item. We offer the complete line of items in the Nantucket Dream ensemble. 14" x 14" ship's wheel pillow. 100% cotton. By C & F Enterprises. Allow approx. 3 weeks delivery on this item. We offer the complete line of items in the Nantucket Dream ensemble. Navy blue pillow with brown button accent. 18" x 18".